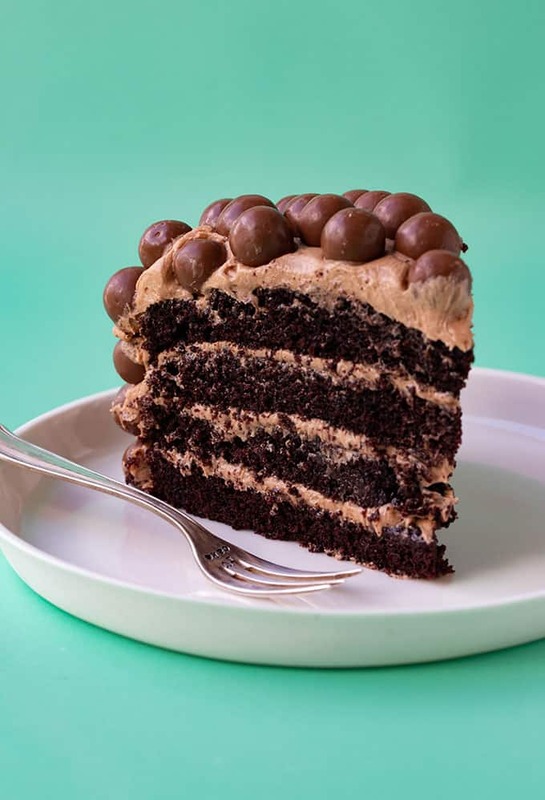 Everyone will love this gorgeous four layer Malteser Cake. 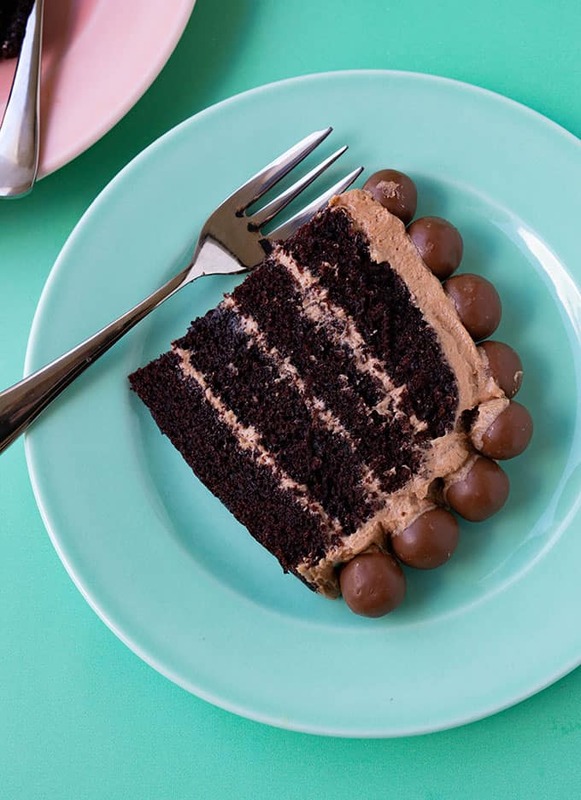 Deliciously soft chocolate cake topped with creamy milk chocolate buttercream and covered in Malteser chocolates. 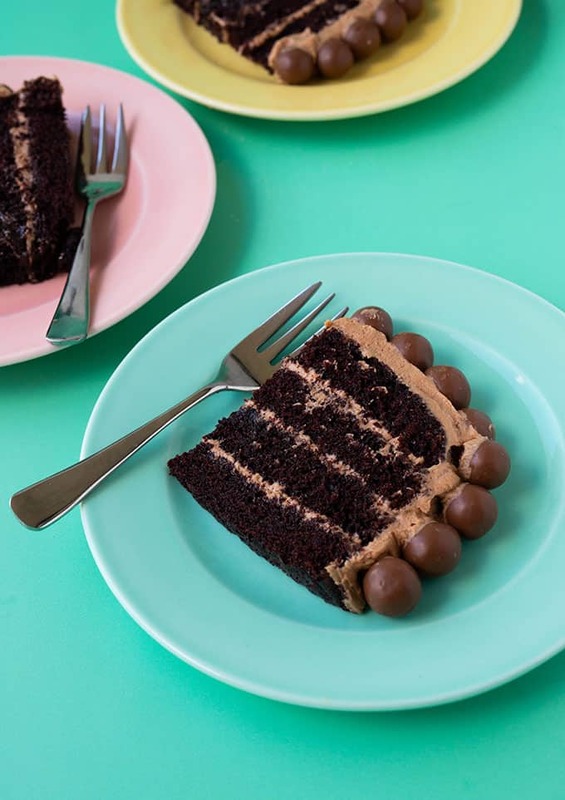 Introducing my Malteser Cake, complete with real chocolate buttercream and a boatload of chocolate malt Maltesers. Can you even?! Hands down, my new favourite chocolate cake. It’s soft, sweet and completely irresistible. There is something magical about chocolate cake. No matter what shape or size. 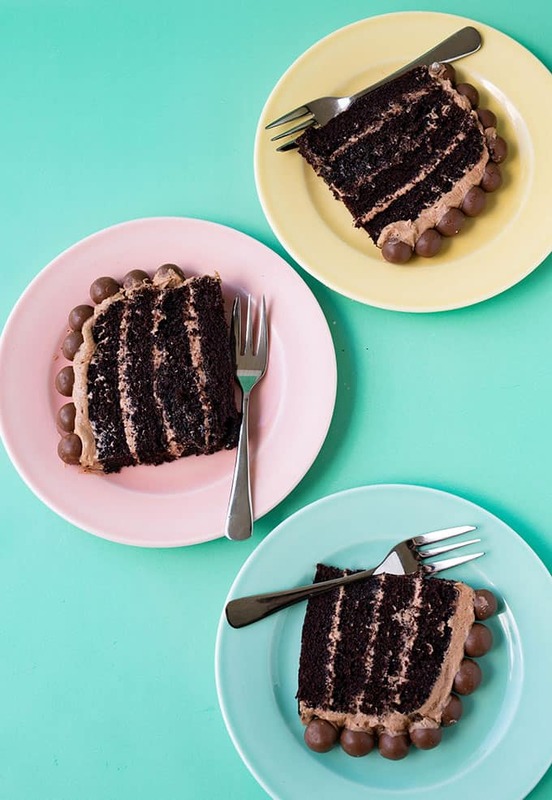 But when you have four layers of chocolate cake, each one sandwiched together with homemade chocolate buttercream, then you have something really special. 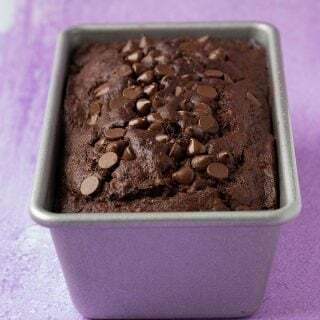 This chocolate cake recipe is my absolute go-to. It’s quick, easy, and it tastes ah-mazing. 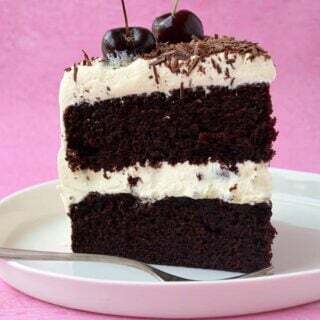 In fact, it’s the same chocolate cake recipe that I use in my Mint Chocolate Layer Cake. Using oil and buttermilk ensures a super soft and moist cake every time. It’s a simple mix and stir recipe, you don’t even need an electric mixer. Once baked, the two layers are then sliced in half to give you four even layers of chocolate cake. Then it’s time for the chocolate buttercream. This soft and sweet chocolate buttercream frosting is made using real chocolate. It adds depth, flavour and texture. I use this frosting ALL the time. Start with softened butter. Use an electric mixer to beat the butter until pale and creamy, then start adding the sugar. Use the milk to help loosen up the mixture and watch as the frosting turns thick and creamy. Melt a mix of milk and dark chocolate in the microwave, then add to your frosting and beat until smooth. Add more milk as needed. Generously frost the cake, between each layer and all over the top. This is a surprisingly easy cake to make. Add the wet ingredients to the dry ingredients and then slowly add hot water. Mix by hand until smooth. Once the cakes are completely cooled, cut each one in half horizontally to make four even layers. The chocolate buttercream is made using real chocolate, which adds a delicious depth of flavour. If you find the frosting is too thick, just add an extra tablespoon of milk or two. 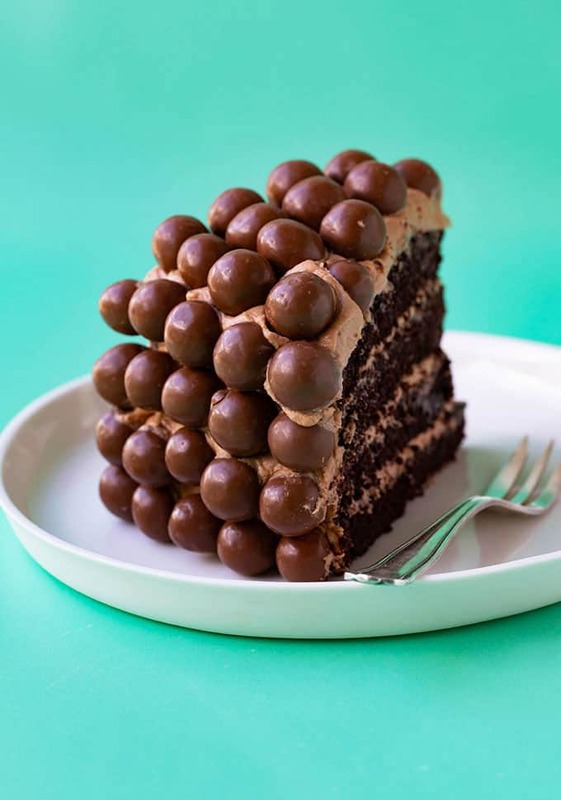 To decorate, cover the entire cake in Maltesers – easily the BEST part. 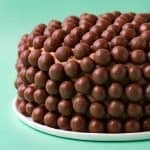 Can you freeze Malteser cake? Yes. If you want to freeze the cakes, let them cool completely, then wrap tightly in plastic wrap and freeze them. 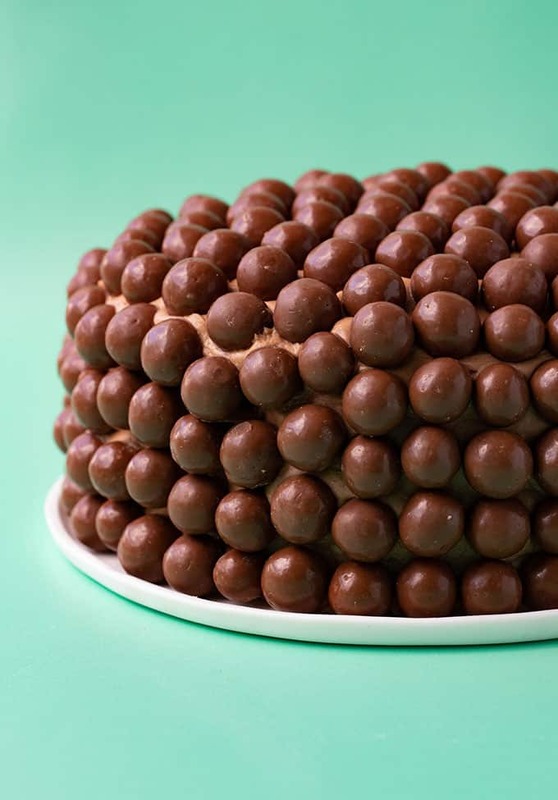 Decorate with frosting and Maltesers when they are thawed and you are ready to eat or serve the cake. 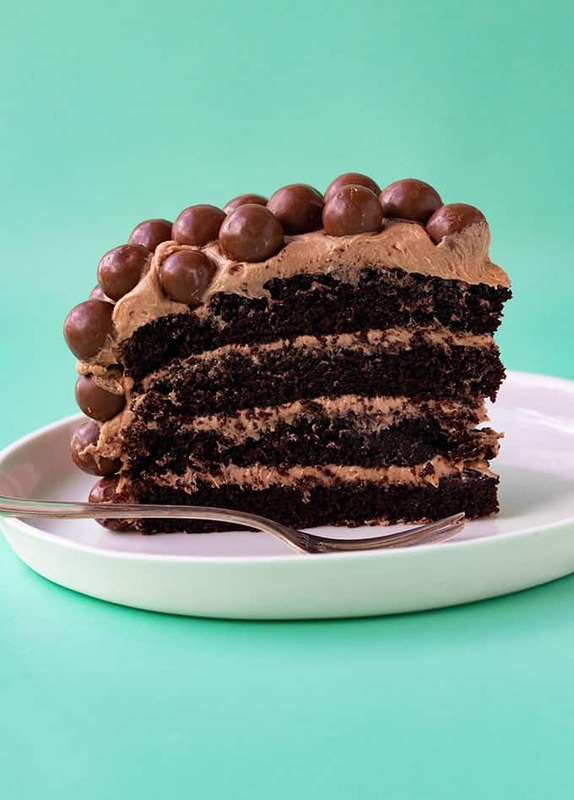 A four layer chocolate cake covered in Maltesers. Preheat oven to 180 C (360 F). Grease and line two 8 inch round cake tins with baking or parchment paper. 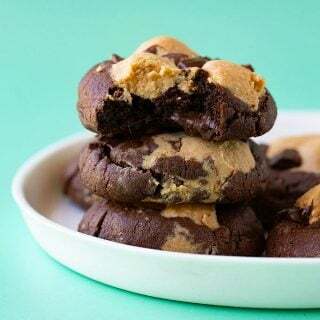 In a large mixing bowl, sift the flour, cocoa powder, baking powder and baking soda. Then add sugars and whisk together. In a separate mixing bowl, add buttermilk, vegetable oil, vanilla and eggs. Whisk together. Boil the kettle and pour out 1 cup of hot water. Add the wet ingredients to the dry ingredients. Start to fold together, slowly pour in the hot water, and continue to mix until all the ingredients are incorporated. Divide the mixture into two cake tins and bake for approximately 30 minutes or until a skewer inserted comes out clean. Leave for 10 minutes before gently removing the cakes from their tins and leave to cool completely on a wire rack. Place butter in a large mixing bowl and beat with an electric mixer on medium speed for a couple of minutes until pale and creamy. Meanwhile melt the chocolate (both milk and dark chocolate) in the microwave, stirring every 20 seconds, until just melted and set aside to cool a little. Once the butter is very pale and creamy, add half of the sugar and a tablespoon of milk and beat on low until the sugar is incorporated. Then, add the rest of the sugar and two tablespoons of milk, and beat on slow until the sugar is incorporated. Next, add melted chocolate to the buttercream mixture, ensuring the chocolate is still smooth and melted but is not warm. Beat until the chocolate is completely mixed through. Add an extra tablespoon or two of milk until frosting is smooth and creamy. To assemble cake, trim the tops of the cakes. Then cake each in half horizontally so you have four layers of cake in total. Cover the first layer of cake with chocolate buttercream, add another layer of cake and repeat with remaining buttercream and cake. Then cover the entire cake with frosting. 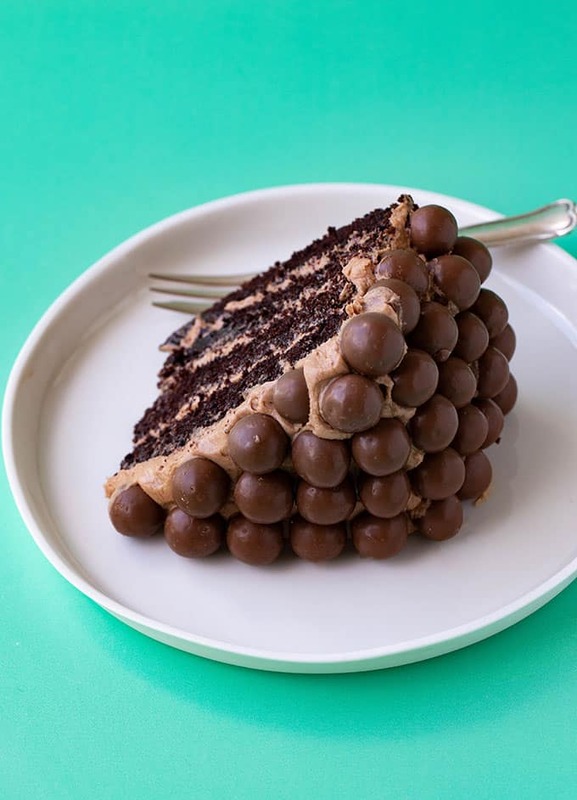 Finally, add Maltesers all over the top and sides of the cake. *Maltesers are Australian candies similar to Whoopers in America. Me again with my hundredth question! If I wanted to do this with white chocolate instead of the milk and dark, can I just substitute out the same amount of chocolate for white? Yes that should be about right! Hiya, what’s the best substitute for vegetable oil? I’ve got soybean or canola. Either of those? I can always zip down to the supermarket but I’d rather not have to! Hi Phoebe! Canola should be fine ☺️ I hope you enjoy it! Sorry, one more question. Do you recommend cooking both sponges at the same time? And if so, would it be better to use fan assisted? It really depends on the size of your oven but if you have the room, it shouldn’t be a problem to bake both at the same time – I usually do. And you can use fan assisted, just drop the temperature down to 160C. Hope that help! Thank you! Do you prefer to bake or fan bake? I prefer using fan forced for even heat. But I always recommend getting to know your oven because they are all so different!